This week, Tania from My Second Sense is being showcased! I hope you enjoy learning a little more about Tania and drop by her blog for a visit. 'interest' is to create things for my classroom. This is my ninth year teaching second grade. I student taught in first and third grade, but I was lucky enough to get my dream grade. students always enjoy working with a partner or in small groups. Engaged learners that reflect, set and meet their own goals. Hopefully, you could also witness a class that follows procedures and enjoys learning. to take full advantage of my personal iPad. I work really hard to implement my procedures and expectations during the first part of the year. After that I try to create a balanced week where we work hard, have fun and learn to stretch our thinking. 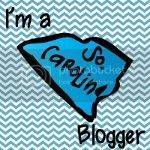 I started blogging to share what I do in my classroom. I feel it is a way to pay back what I have learned from so many amazing blogs. My goals is to share what I love and help others with what I can. the chance to meet new Bloggy friends. Would you visit my blog and let me know what you think? Hope to see you there! 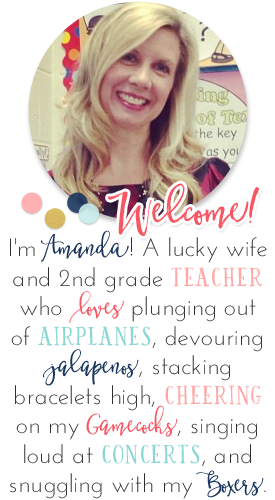 Amanda, thank you so much for the opportunity to introduce myself to all your amazing followers.